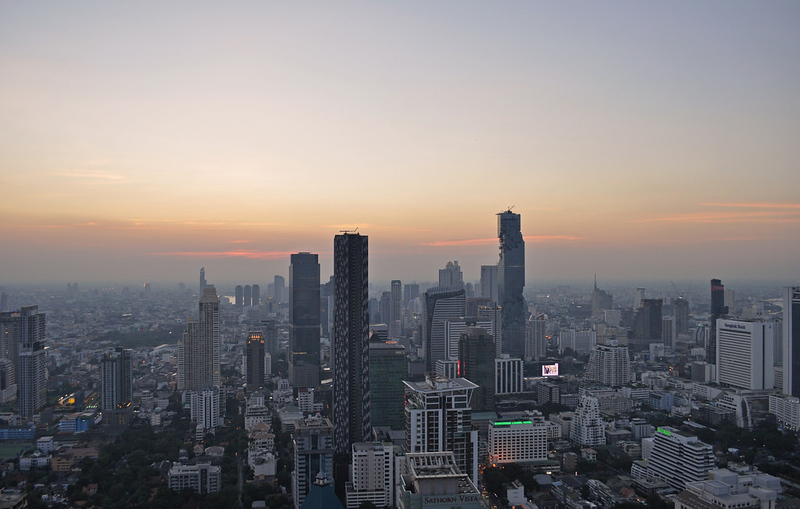 Apartment and condo prices in Bangkok have been rising over the last decade, especially in the city’s most popular expat areas. As such, a lot of the “complete guides” to Bangkok real estate from just a few years ago feature prices that are out of date at best and 30-40% too low at worst. This can make working out how much you should pay for an apartment much more challenging than it needs to be. To help you get the best value for money when you rent in Bangkok, we’ve scoured a variety of property listings and combined the data with first-hand knowledge of rents in Bangkok to build a detailed list of what you can expect at a variety of price points. Let’s start with Bangkok’s ultra-budget apartments, which are priced at 10,000 baht per month or less. Most sub-10,000 baht apartments in Bangkok are located toward the end of the BTS and MRT lines. You’ll find a lot of apartments in this price range from On Nut BTS onwards to the end of the Sukhumvit Line, and in the Huay Kwang to Bang Sue stretch of the MRT. For 10,000 baht or less, you can rent a small studio apartment in Bangkok with about 20 to 40 square metres of space. You’ll usually also get a small balcony that doubles as a place to dry your clothes, plus a simple bathroom. If you’re lucky, you might even get a small kitchen. If you’re looking for a really cheap apartment (for example, something available for 5,000 baht or less), you’ll need to look further away from the BTS and MRT. Note that since most of the apartments in this price range are owned by the building, you’ll have to pay higher-than-average rates for electricity and water. Some buildings will also charge rental fees for appliances and a monthly fee for Internet access. Apartments in the 10,000 to 20,000 baht per month range are usually larger, newer and more centrally located than their cheaper counterparts. You can also rent a variety of small condos with this budget, which will give you access to a pool and your own Internet connection. The best areas for apartments in this price range are middle class Thai neighbourhoods, such as On Nut, Bang Chak, Saphan Kwai, Victory Monument, Huay Kwang and Ladprao. If you search a little further away from the BTS than most people, you can also find some great one-bedroom condos in this price range. Many of the buildings around Ladprao Rd have large, sunny condos available for 20,000 or less. With a budget of 20,000 to 30,000 baht per month, you’ll be able to rent a one-bedroom condo in a desirable, upmarket area like Ari, Thonglor or Phayathai. You’ll also be able to rent a larger two-bedroom condo in areas less popular with expats, like Ladprao or On Nut. If you choose a popular expat area like Thonglor, you can expect to get a 50 to 70 square metre condo for this budget. You might also be able to find a larger unit in an older building or a condo building with a less convenient location. With a budget of 30,000 to 50,000 baht per month, you’ll be able to rent a large two-bedroom condo in most parts of Bangkok. In the more expensive expat areas like Thonglor, Asok and Phrom Phong, you’ll get slightly less for your money — typically a large one-bedroom condo. There are also some great older condos available in this price range. If you’re alright with living in a 15 to 25 year old building, you’ll be able to rent a large, 100+ square metre condo with this budget. This budget gives you access to a lot of condo buildings located directly beside BTS stations, letting you avoid a five to 10 minute walk to the station from your room. You’ll even be able to find condos with direct skybridge connections to the nearest BTS station. With a budget of 50,000 to 75,000 baht per month, you’ll be able to rent a two-bedroom condo in some of Bangkok’s most luxurious buildings. Most condo buildings with units in this price range have facilities on par with a five-star hotel, as well as excellent locations. If you prefer a larger unit in a less glamorous building to a mid-sized unit in a world class condo development, you can also easily find a large three-bedroom condo in a 5-10 year old building that’s comfortably within your budget. You’ll also be able to afford some mid-sized duplexes and corner apartments with great views over the city. For 75,000 to 120,000 baht per month, you’ll be able to rent a large three-bedroom unit in one of Bangkok’s top condo developments or a penthouse in a mid-tier condo building. You’ll also have no problems paying the rent for a spacious new four-bedroom family home outside the city. Compared to the 50,000 to 75,000 baht per month price bracket, apartments priced at 75,000 or more per month are usually larger, with extra bedrooms and larger living spaces. They’re more likely to be located on the corners of buildings and offer a 270° view of the skyline. At the high end of this price range, you’ll also be able to rent some of the smaller units in super luxury developments that feature private swimming pools and wraparound balconies. If you have a budget of 120,000 baht per month or more, you’ll be able to rent a huge condo in one of Bangkok’s most exclusive buildings. Most units in this range are either duplexes, corner units or penthouses, often with features like private plunge pools. Condos in Bangkok can extend well into the hundreds of thousands of baht per month, meaning you’ll be able to spend as much as you can afford to on accommodation. Almost all of the prices you see for condos listed online are negotiable, often by a surprisingly large amount. Our guide to cheap long-term accommodation in Bangkok lists the best ways to find, compare and negotiate on condos in Bangkok to get the lowest possible rental price.